ACT 46 ON TRIAL: H. Brooke Paige appeared before the Vermont Supreme Court on Thursday to argue for the rights of local communities to control their schools. MONTPELIER — The candidate who made national headlines for winning six primary election contests in August is waging an even bigger battle in Vermont’s highest court: the battle over Act 46. Vermont’s K-12 education system is comprised of around 76,000 students and about $1.7 billion in state taxpayer money. The question of who controls these vast resources was in sharp focus Thursday morning at the Vermont Supreme Court. Standing at the podium before the justices was conservative politician and activist H. Brooke Paige, the Washington resident who won six statewide primary races in August, and now is challenging Secretary of State Jim Condos in the general election. But on Thursday, the issue that mattered is whether Act 46, Vermont’s highly contentious school district merger law, is constitutional. Paige said people in the towns of Washington and Orange were faced with giving up their governance and school building due to an Act 46-required merger. “You have two school districts under the supervision of the AOE [Agency of Education] and [they’re] basically coerced, threatened and bribed into coming into an agreement. And subsequently, they are having to go to the voters, and the message that they convey is ‘we have no choice in the matter,'” he said. On Thursday, Paige argued that the school governance law is unconstitutional. “This wasn’t just irregularity in contracts. In fact, the whole mechanism of Act 46 did not comport with the statutes in Vermont as far as the open-meeting rules, as far as the composition of public bodies, and numerous other statutes,” Paige told the court. At one point, Chief Justice Paul L. Reiber interrupted to ask if the state has precedent to regulate public schools. “The Constitution, clearly it allows the General Assembly to make provisions for schools and does not require that it do so in each and every town under Chapter 2, Section 68, does it?” he asked. Paige responded that most of Vermont’s towns and schools pre-existed the state, which indicates that management of the schools must ultimately lie within the community. Paige said that in the lower courts the state had argued that the Brigham decision, which concerns equity in school financing, also implies that the state has control over school governance. Paige suggested the decision was poorly executed and that Brigham should not be interpreted as anything more than a reassertion of powers the state already had to direct state money for school budgets to ensure equity. Philip Back, an attorney with the Vermont Attorney General’s Office, represented the state at the stand. He argued that Paige doesn’t have standing to bring the suit. Back nonetheless asserted the position that the state has the power to enforce Act 46 even without the Brigham decision. After the hearing, Paige told True North that he is challenging the law because he’s concerned for the general welfare of the children who might be harmed by Act 46. This is not likely the last lawsuit regarding Act 46. 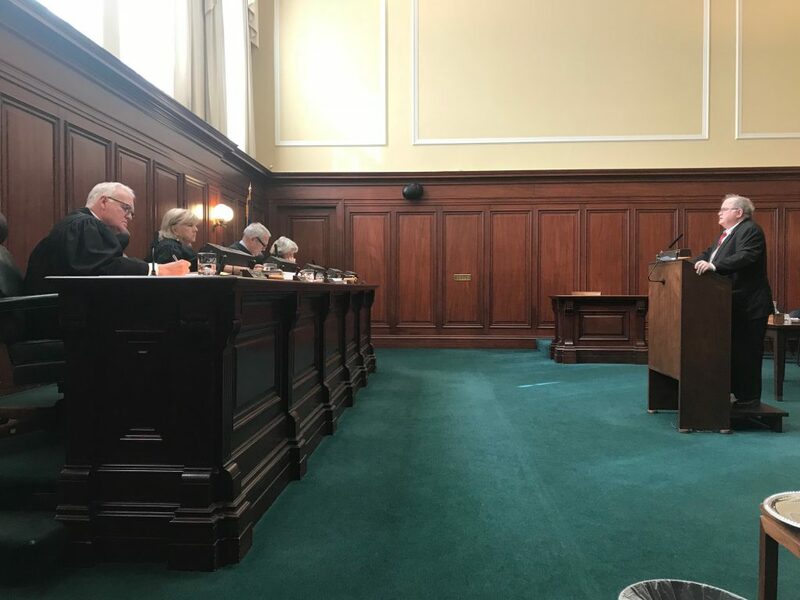 Former Hazen Union School Board Chair David Kelley told True North he and other lawyers, and possibly 21 districts or more, may be bringing their own legal challenge to the state along similar lines. In September, an attorney representing the Alliance of Vermont School Boards Members sent a letter to the Vermont Agency of Education and the State Board of Education saying the group would sue over forced mergers. What follows is the only reference to ‘schools’ in Vermont’s Constitution. Laws for the encouragement of virtue and prevention of vice and immorality ought to be constantly kept in force, and duly executed; and a competent number of schools ought to be maintained in each town unless the general assembly permits other provisions for the convenient instruction of youth. 1. “…a competent number of schools ought to be maintained in each town…”. It does not say …a competent number of schools ‘Shall’ be maintained in each town. 2. “…unless the general assembly permits other provisions for the convenient instruction of youth”. This is the apparent wild card in Vermont’s education governance. None the less, “…the convenient instruction of youth” remains the purview of “…each town…”, albeit with ‘general assembly permission’. b. 16 V.S.A. § 822. School district to maintain public high schools or pay tuition. These Vermont Statutes, in effect since 1969, clearly authorize the ‘School District’ to make virtually every decision regarding education governance in Vermont. Now comes Act 46, the General Assembly’s carefully crafted ‘end run’ around constitutionally authorized local School District governance in Vermont. If the State, through its State Board of Education, as empowered by its General Assembly, can force any School District mergers, at what point will it not only be feasible but necessary to merge all Vermont School Districts into a precious few districts, or even one School District with one school board? Here’s my prediction: follow the money. Twenty-two thousand three hundred sixty-eight and 42/100 dollars per student per year (the most expensive education revenue stream in the U.S.) carries a lot of weight in State of governmental cronyism, be the cronies school board members, legislators, State administrators, their appointees or the myriad education special interest lobbies stalking their prey at the great public education watering hole. And isn’t it interesting that while Article 1 of Vermont’s constitution says: “That all persons are born equally free and independent, and have certain natural, inherent, and unalienable rights, amongst which are the enjoying and defending life and liberty, acquiring, possessing and protecting property, and pursuing and obtaining happiness and safety;…” that the very essence of our freedom and liberty – namely the education of our children – is being systematically taken away from us. On election day, vote only for those representatives espousing educational freedom of choice! Our children’s future depends on you. Follow the money, you’ll find it was those lobbyists who wrote these stupid plans. It has nothing to do with our children and everything to do with filling their pockets with money. Montpelier is run by lobbyists, PACs and connected friends (cronyism)…this is the best and most classic example. Nobody can change anything or do anything that makes any sense, because they aren’t the lobbyist. It’s really disgusting, when you look under the hood, you’ll be shocked, I know we are, we had no idea how bad Vermont was until we started investigating, still hard to believe. Here’s a link where we talk about some things. It’s so great to have someone stand up to this fiasco called ACT 46. How can having no school in town be better than having a school in town? If we taught the basics our kids would be a world better for it. We wish you the very best, we too would abolish Act46, stop all funding and develop a clear, simple formula. While you’re there Brooke, ask them how come the unelected, un-appointed lobbyists get to run our government and schools. Where’s that in our constitution? Truth be known we probably did better with one room 100 years ago. Agreed! Brooke is doing a huge public service by both running for office and pursuing this court challenge. As Governor I will seek the Repeal of Act 46, the elimination of the Agency of Education and going from 162 Supervisory Unions down to 50. This is what must be done in order to prevent the further destruction of the Vermont Public School System. For these two ideas alone, you a Brooke should be holding Vermont office. I am sorry to say publicly that I no longer trust you, certainly not to lead our state government, but as you use this public forum to further your ambitions I find it necessary. You recently tried to convince True North readers of your pro 2A stance, a poor attempt to cover the strong anti firearm position you expounded on in February this year writing in the Rutland Herald. “2/24/18: “Guns kill people” Commentary by Charles Laramie. “It’s my view that guns don’t keep us safe. They kill us. I know the old argument: Guns don’t kill people, people kill people. It’s the old argument for people who are afraid the government is going to take away their guns. So why is it that people want magazines for their guns that can fire more than they would be able to legally use while hunting? On a very different hand, I strongly encourage folks to vote for H. Brooke Paige for Secretary of State, Janssen Willhoit for State Attorney General, and Don Turner for LT Governor. For a thorough review of all state office seekers and their positions on the 2nd Amendment refer to the excellent research compendium by the Gun Owners of Vermont. Two independent candidates for Governor, Cris Erickson; and Trevor Barlow, who impressed me when I met him today; both strong 2A supporters, provide an alternative to Scott, who not only lost my trust but by whose pen endangered all Vermonters. By clicking on the candidate names in the above referenced report, in depth and we’ll sourced information appears.